Ch Pendragan Sorcerer is a multi Excellent Graded (including 2002 National), Best Exhibit In Group & Best Exhibit In Show winner. 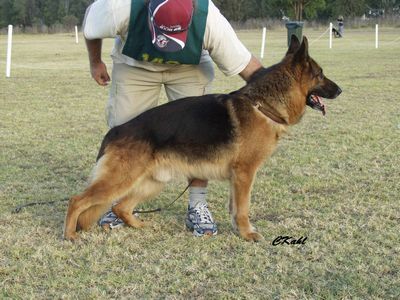 Ch Pendragan Sorcerer is an imported in dam dog from the 1993 German Sieger Jeck vom Noricum. He is Breed Surveyed Class 1 & has a hip score of 4,2 ie total 6 & an elbow score of 0,0. His description from his breed survey reads " Large(65 cm),substanial dog of good type, good head & expression. Very good pigmentation. Good wither, firm back, the croup is of good length but is set slightly steep. Very good fore & hind quarter angulation, good proportions. Very good forechest development, good top & underlines, moves correct coming & going. Moves with very good reach & drive, the back remains firm during movement. Character & temperament firm. Stands firm under the gun. Substanial dog of excellent type. Overall firmness a virtue. Pigmentation strong."